My father. Bless his heart, but for as much as he tries, he’s so predictably underwhelmed when he receives gifts. The only time I’ve ever seen him excited about a gift is when my sister or I would give him a handmade gift as a kid. It’s that innate father’s pride, y’know? And as you get older, it becomes more difficult to make your dad a gift. No longer will popsicle sticks held together by glue and gummy worm residue cut it. It’s that perfect combination of DIY personal touch meets masculine practicality. It’s strong enough for a man, and it’s made for a man. 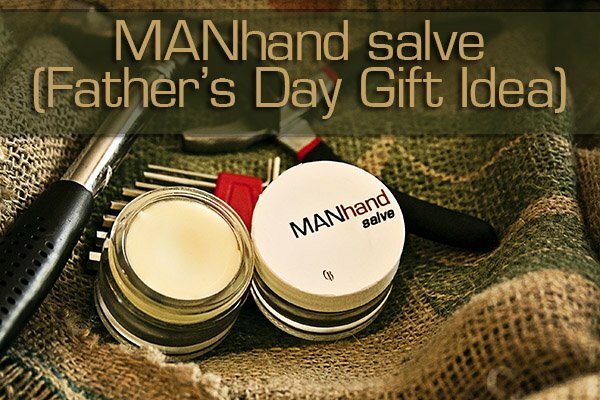 It also smells quite manly, but nourishes his work-worn hands in a way that will melt his heart in a very tender, unmanly kind of way. But just for a second. Ahem. We’ll go over how to do it the long way and the short way. What you need: An oil or two (I used sweet almond oil and avocado oil, but you could also use olive oil, sunflower oil, apricot kernel oil, etc.) and healing herbs (this recipe includes calendula and comfrey, but instead you could use chamomile, peppermint, or any other healing herb). Always add more oil to your infusion than what you’ll need for the final recipe. 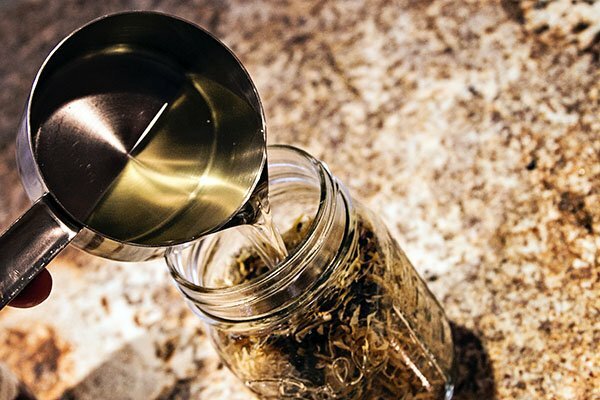 You’ll lose some of the oil as it adheres to the herbs in your infusion. In addition, you want to add enough oil to your infusion to completely cover the herbs. 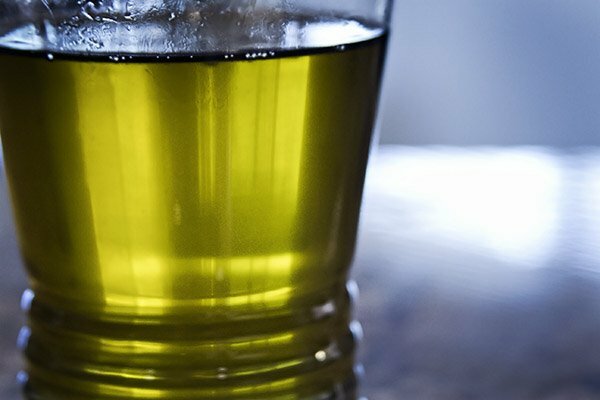 It’s okay if you have more infused oil than you need. 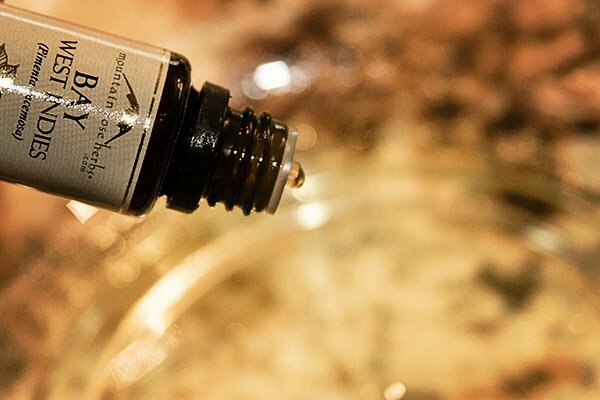 You can always make extra salve for yourself, or just pour more oil over the tops of the herbs and infuse even more for the next few weeks. Or, if you’d like, just strain it out and pour it into a jar. Then, over the course of the next few months, use it as your super amazing healing oil whenever you have dry skin. That should still yield a good amount, with a little extra left over for mama. Mama likes that. Tip: Make sure your oil covers your herbs completely. That’s the most important part. Second most important – choose a jar that leaves little room for air once you have it filled up, if you’re going to use the long, let-it-infuse-with-time method. This helps inhibit moisture accumulation, which is something you’re trying to avoid. Infusing oils with the long method: All you have to do here is put your oils and herbs in a jar with an airtight lid and let it sit for 2-4 weeks. 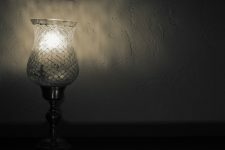 It’s better to do this somewhere the temperature is relatively constant, often warm, and perhaps sometimes in the sun (the sun will speed and strengthen the infusion process). Seal your oils and herbs into the jar well, making sure there’s no way for water to enter. Place a shallow, heat-proof dish (the one in the photo is ceramic) at the bottom of a pot full of water, so the glass isn’t in direct contact with the metal, helping to sustain constant temperatures around the herbs. Turn your burner on low to simmer, and let your jar full of oils and herbs “take a bath” for 1-2 hours. Do not let the water boil. It should be very warm, but not so hot that you can’t touch it. Occasionally shake the jar and place it back in the water. When you remove it, wipe it down very, very well with a clean towel and then leave it alone to completely air dry for 10-15 minutes (remember, we need to avoid all contact of water to the oils). And that’s it! You know your oils are well infused with the herbs contained within feel a little bit crunchy if you stick a spoon in and press down. It’s time to strain the oil from the herbs! 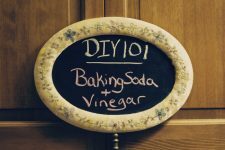 For this, you’ll need a sanitized glass, a coffee filter (or cheesecloth), and a rubber band. Slowly pour the oil into the filter, allowing it to filter through before pouring more in. 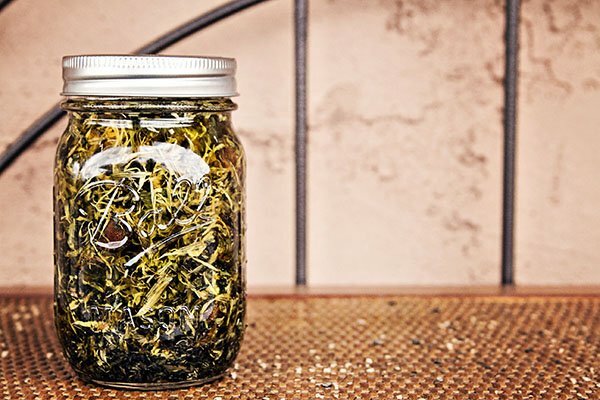 You may need to change filters or move your cheesecloth around a bit if it becomes clogged with herbs. That right there is some strained oil, mama. Mama likes it that way. Next, measure out your ingredients in your melting apparatus: For this recipe, we used 7 ounces each of herb-infused oil, coconut oil, and beeswax. Let it be known, as long as you use equal parts of each ingredient, you’ll be just fine. Though the consistency might be just slightly different, don’t be afraid to measure things out using cup measures (for example, 1/2 c. of each ingredient). Measuring by weight just helps with absolute accuracy. 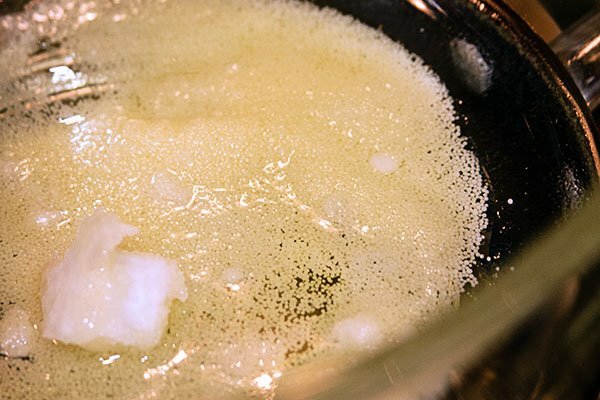 To melt oils/beeswax: It’s best to use a double boiler, or a makeshift double boiler. For this recipe, I used a thick glass bowl we have that fits perfectly on top of a pot. Fill the pot about a quarter of the way with water, place your melting container on top, and turn the heat on the burner to medium low. The steam from the water will gently and evenly heat the ingredients above it. (REMEMBER, make sure you don’t get water in your oil/beeswax mixture). Stir your mixture a few times while it’s melting. And snack on some strawberries or something. Have a mimosa. Get down to some Captain and Tennille. Once your mixture is melted, let it cool momentarily (but not too long) and drop in your essential oils if you’re going to add them. You don’t have to, by the way. 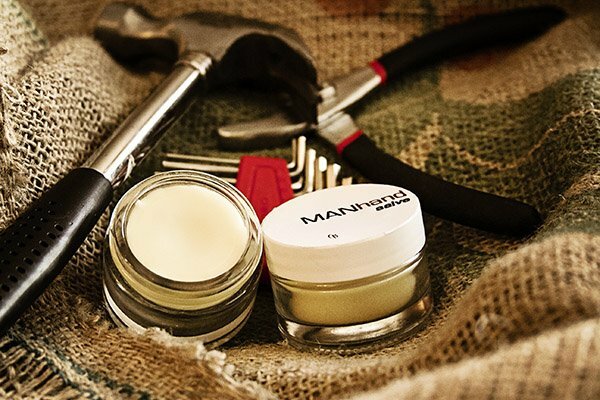 This salve would be perfectly wonderful without them. But this recipe calls for 11 drops bay essential oil, 7 drops cedarwood essential oil, and 4 drops lemon balm (melissa) essential oil. Stir it all together and pour it in your jar. Let that cool. It’s going to look really weird for a minute. Like this. Once it’s completely cool and solidified, pop the lid on it. Give that lid an awesome label. To make the infusion: Combine oils and herbs in a small jar (adding more oil or more herbs if necessary to fill the jar completely). Either close the jar tightly and leave in a warm place for 2-4 weeks, or use a warm water bath for 1-2 hours to infuse the oils. 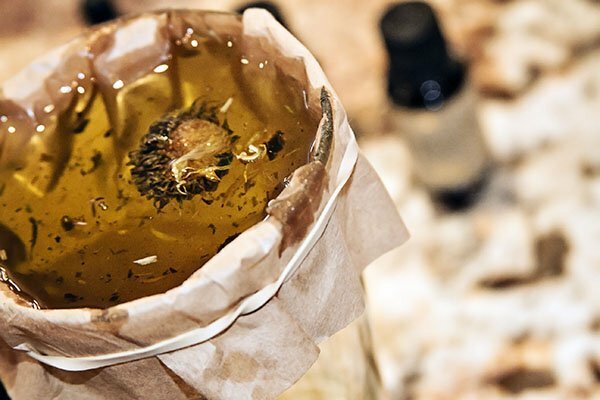 To make the salve: Strain the oil from the herbs using a coffee filter or cheesecloth. Combine infused oil with coconut oil and beeswax in a double boiler (or makeshift double boiler). Melt completely. Let the mixture cool for a few moments, but not until it begins to harden, and then drop in the essential oils. Stir well and transfer to your glass container. Should keep, lidded, for 6-12 months (or more). Apply to work-worn, dried, or cracked hands. Feel like a man. A man’s man. For this recipe, all of our ingredients came from Mountain Rose Herbs, with the exception of the beeswax. 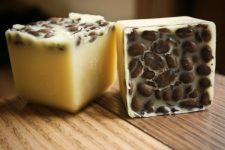 The beeswax pictured in this recipe is Frontier’s white beeswax beads, which melts really quickly and does the job faster than most (that said, I do also enjoy Mountain Rose Herbs beeswax). I purchased the Frontier beeswax beads at iHerb (if you place an order via that link right there, you’ll receive an automatic coupon of $10 off your first order of $40 or more, or $5 off your first order of anything less than that), but you can also find beeswax or beeswax beads at your local natural foods store. I have a few left at the Crunchy Betty’s Natural Market (yay!). There aren’t too many left, so if you see this and want to order it, do it quick like a hairy, burly, manly bunny. It should be to you (if you live in the U.S.) in time for Father’s Day. Do You DIY For Father’s Day? Is it just me, or are men more difficult to DIY for than women? 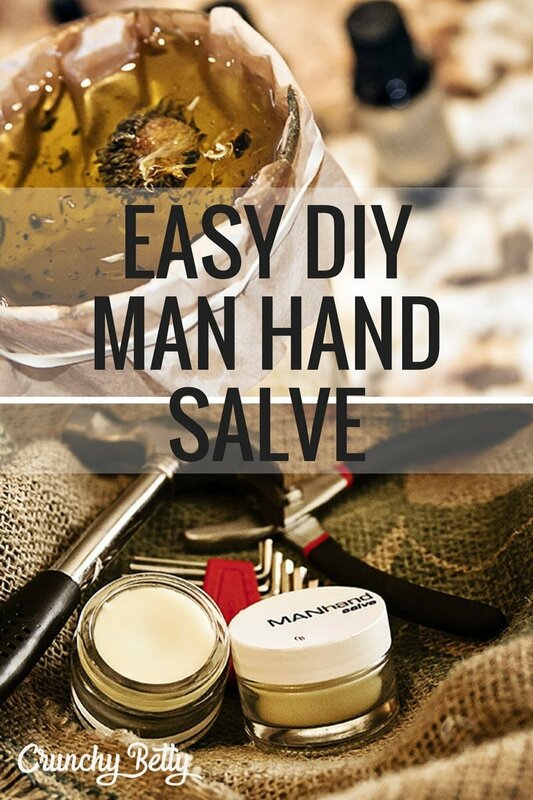 (That’s one of the reasons I looooove this salve – it’s so simple and practical for him, and fun to make, for you). Do you, will you, or have you DIY’ed for Father’s Day? This sounds wonderful! I really should invest in some herbs for oil infusions to try some of those recipes out… 🙂 Thus far I’ve been lazily sticking to an easy body butter lotion that does wonders for my feet. Men are by far harder to DIY for. Hard to crochet for, hard to craft for in general. Question…What part do the EOs play in the healing part of the salve – or are they just to add the manly scent? Also, since Melissa EO is SUPER expensive and I have it growing out my ears – well, not actually out my ears, but all over the yard because it wants to take over the world like Hitler, but in a wonderful, healing kind of way… Anyway, couldn’t I harvest the Lemon Balm and infuse it into the oil with the other herbs and get the same benefit? I infuse the herbs of expensive EO plants all the time! The results are supposedly more subtle, but I find them to be wonderful! Just be sure to let the fresh plant dry in a shady, airy place for awhile first. The plant material has a lot of moisture and will create ‘ickies’ in your oil if infused fresh. First, I have to say I got your tropical deodorant cream and I LOVE it! It seems to be working, smells good, and eliminates my fears about harming myself with aluminum-based products. Secondly, I just might try this recipe for the important men in my life. Third, I don’t find it any harder to DIY for most of my guys. They all seem to appreciate things like homemade jams/preserves/fruit butters, and some of them like hand knits like fingerless mitts. Maybe I’m just lucky! Ooh I am so trying this! How long would it last? Awesome recipe as always! Where do you get the 1 ounce jars from…is that from Mountain Rose Herbs also? I’m going to try this with fresh herbs — thanks for explaining it to the above commenter. Also, I’m so happy you’re back! It is so great to have you back. I have already learned so much from you. These are not happening for father’s day, but this would be the perfect stocking stuffers. ALL the men in my life love hand/homemade, so they will be thrilled. Now I will be waiting with suspense to find out your father’s reaction… Will you share it in a future post? I imagine it won’t be, “Oh work, okay, this is great, thanks”! Thank you as always for all the awesome legwork you do to share these fabulous recipes! I tried this recipe out yesterday. didn’t use any EO but infused lemon balm. But my problem is with equal amounts of infused oils, coconut oil and beeswax it comes out like a hard lotion. so I have to use my nail to scoop it out. Any ssugestion about making it less hard or easier application? Other than that, I love it. Works wonderful on my hands, cuticle, elbows and feet. Thanks for so many great recipes ans useful information. Don’t use as much beeswax. 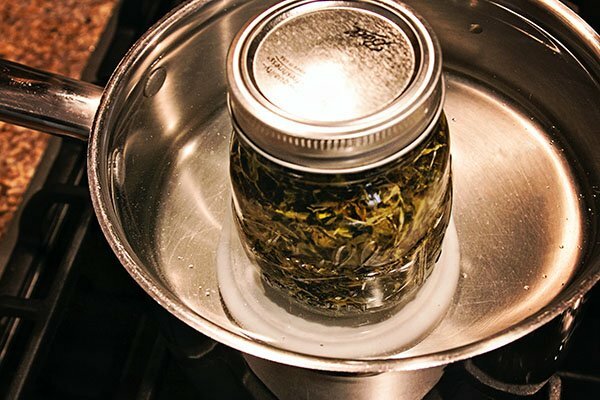 Is it okay to use heat to infuse oils with dried herbs? Not just for the man salve, but just in general? I make a face oil with argan, evening primrose, and rosehip oils, some vit E oil added to preserve, and rosewood, palma rosa and chamomile EOs. I made a huge batch a couple of months ago, and have about half left that I would like to infuse with thyme. I moved across the country and changed my diet (for the better), and my skin HATES me. Tamanu oil as spot treatment helps with the aftermath, but my cheeks are a mess of pimples, blackheads and whiteheads and bumps. I made it to 28 without any skin problems, and now I don’t know how to deal with blotchy, bumpy skin. oh yeah, the reason I ask is because I don’t want to wait two weeks! oil washes are NOT meant for everyone!!!!! my sis and i follow a lot of the same sites for natural recipes (just like this AMAZING one 🙂 but her skin is SO different from mine! she uses oils to cleanse (but still breaks out sometimes and has drier skin than mine). i have innately oilier skin and i use antibacterial soap (DIAL, from the pump bottle, yes) and it is amazing for me!!!! sure its not all natural but sometimes, eh, i’ve learned i have to pick my battles. thats one i’m not going to mess with. i use olive oil under my eyes for wrinkle prev. and coconut oil if i happen to have a dry spot but other than that, leave it alone after the antibac handsoap wash lol! The oil infusions have begun:). One for my soothing deodorant and one for a bunch of MANhand salve!!! Thanks for this! My dad is a gardener in his free time and always struggles with dry skin on his hands. I made him some of this salve using rosemary and mint from my garden, infused into grapeseed oil. The scent turned out a bit more…herbal…than I would have liked so I added a bit of (fake) peppermint fragrance I had from some prior soapmaking experiments. I had so much infused oil and my tins were so big that I made four batches of this at double the recipe size. Looking forward to enjoying it myself! What is the shelf life for this recipe, and some of your others (face oil, deodorant, etc.)? PS I’m going into week 3 of “no poo”…it’s difficult, but now that I’ve discovered cornstarch to be the perfect dry shampoo, it’s getting much easier! Sorry! I see that you said it will keep 6-12 months…don’t know how I missed it! Just now trying the deodorant recipe from this site. Tried one about a year ago, somewhat similar & did not have good luck with it. However, have since learned that I can adjust this & add more coconut oil & less baking soda which I think will help as I had very red & sore pits the first time around. Hoping it works cause I would like to get away from the commercial junk. WHAT is he going on about???!!! And WHY???!!! Take a breath and breathe…. Is it all right to use metal containers? Or would that negatively affect the salve? Thanks so much for the recipe! Hello, I would like to know about the texture of the salve. Is it easily spreadable at room temp? OR is it more like a harder, oilier substance? The sale of dried comfrey is illegal in the US apparently. What can you use as an alternative? Just dry your own when you grow it. Or don’t. So I made this salve and was really disappointed when it cooled off and was hard as a rock. I thought perhaps I had put to much bees wax in but I used what the receipe calls for. Is it supposed to be like this? Super frustrated that it didn’t work out. This is awesome! Made some last night for my mom and my sister. Mine turned out to have yellowish-greeny color I guess because i used olive oil as a base. Also, I have a question- the salve i made is really hard. Should it be that way or did i maybe use too much wax? Thank you so much for this recipe! Wearing Mocha-Frappuccino Mask while writing this post. Love love love love love it!! Amazing write up.. My husband love to make skin care products at home. Tea tree oil for its antiseptic properties and Eucalyptus for relieves congestion are his favorite ingredients. Great.. I like the blend mentioned above because it looks refreshing and reminds me of the Defense Salve, which I love. My daughter is so excited to try this recipe for her dad. But, as I was reading the article again, to prep, I was confused. Is it 7 oz. each of herbal infused oil, coconut oil, and beeswax, or .7 oz each? Thank you, we love your site so far. Nutmeg-milk exfoliating is awesome! Was wondering about this also-is it 7 ounces or .7 ounces? I’m going to try this for christmas gifts along with a Masculine Scent Jar Idea I got on motherearthliving.com – but I want to make it without doing the infusion. Do you think it would work to just use grapeseed/coconut oil instead? That’s how I’ve made my other salves… I’m assuming it just wouldn’t be as strongly scented? I have a question about the coconut oil. Do I use the liquid or the solid when melting with the beeswax? I am making shaving cream for my hubby as well and it called for the solid coconut oil and I used the liquid and it’s not coming out right. Wanted to check before I start this! Thanks!! 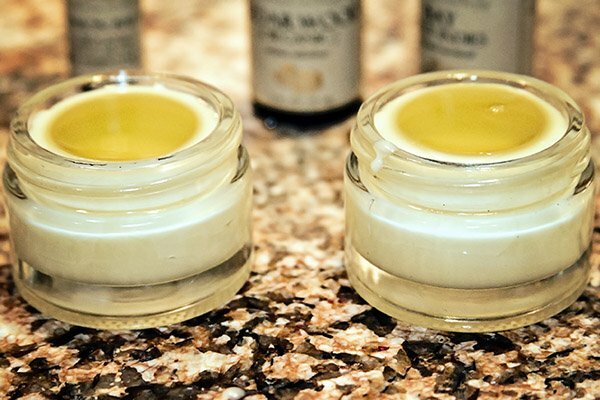 Emily – for this recipe to be a salve, you couldn’t substitute the beeswax with Shea butter as it wouldn’t harden. And the beeswax acts as a protective layer. You could add some Shea butter but not use it total replacement. This looks great, and sound very interesting! I will definitely try to make this for my boyfriend. He’s a guitar player, and has to nourish his hands. Thank you for this recipe, and keep up the great work! I did not find an answer about the hardness of the salve, is it supposed to be hard or is there an adjustment I should make?